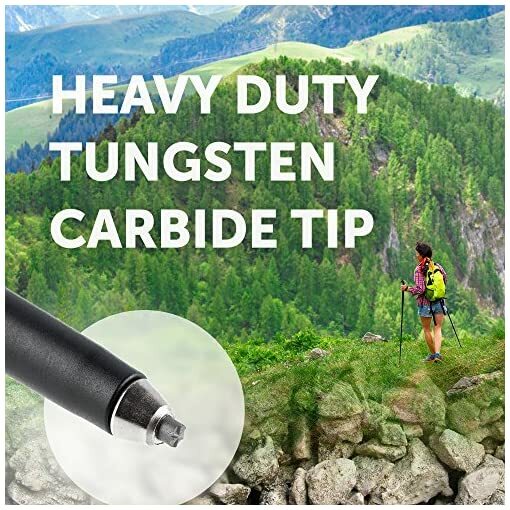 FINEST QUALITY TREKKING POLES with superior NEW design. 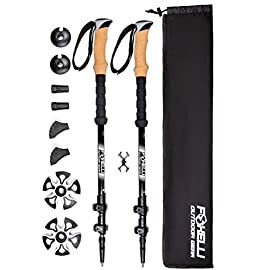 These are made of ultra-rugged Carbon Fiber that gives you remarkable stability while maintaining a very light experience. 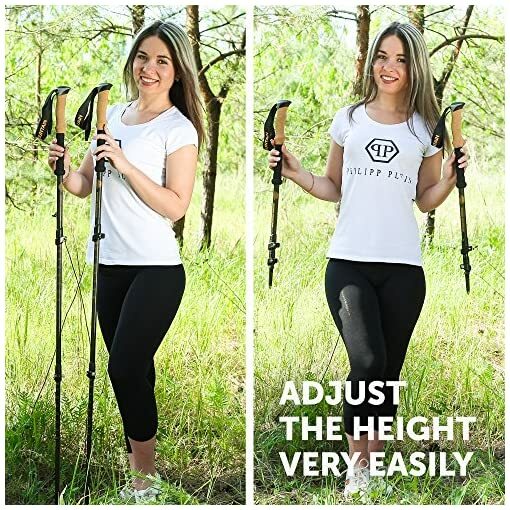 The length is fully adjustable to match your height and use. 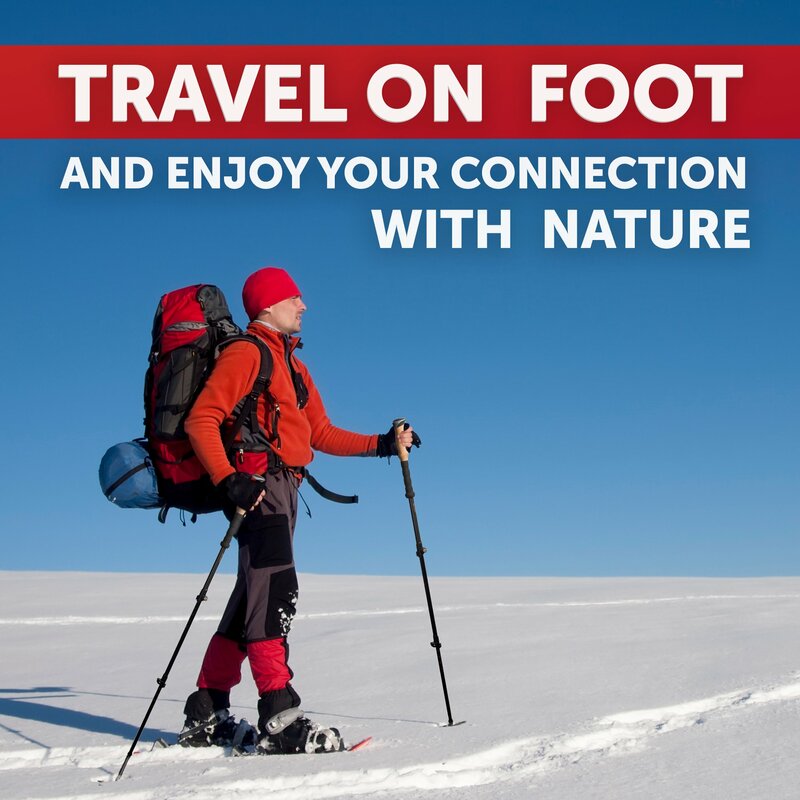 Your hike, snowshoeing, backpacking will be so much more comfortable. 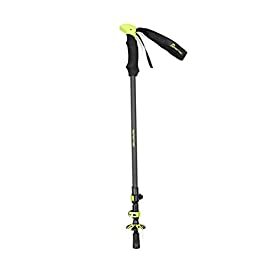 ALL TERRAIN WALKING STICKS lets you trek on any condition including sand, mud, gravel, asphalt, snow, ice and more. 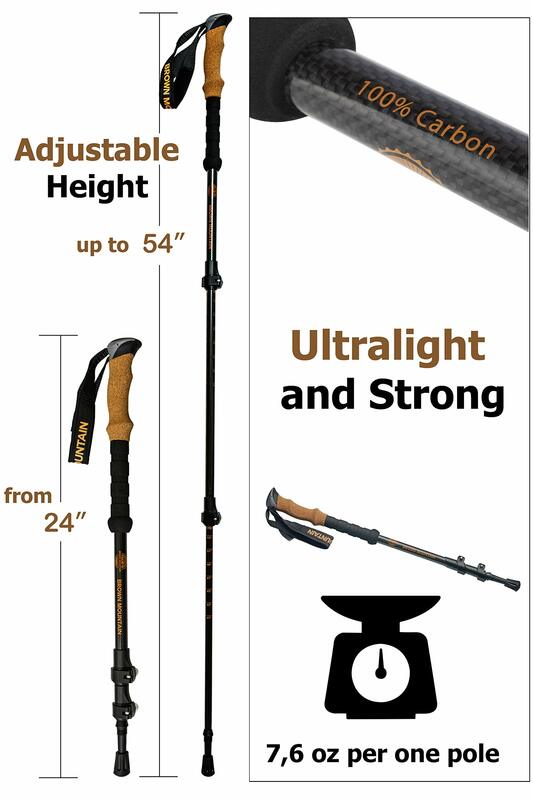 ULTRALIGHT CARBON FIBER MATERIALS makes thease these walking sticks very strong. 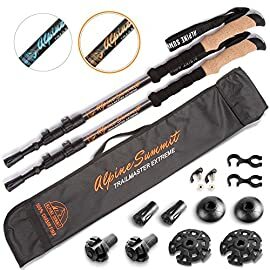 You will love how you can walk all day and never get tired with these poles. 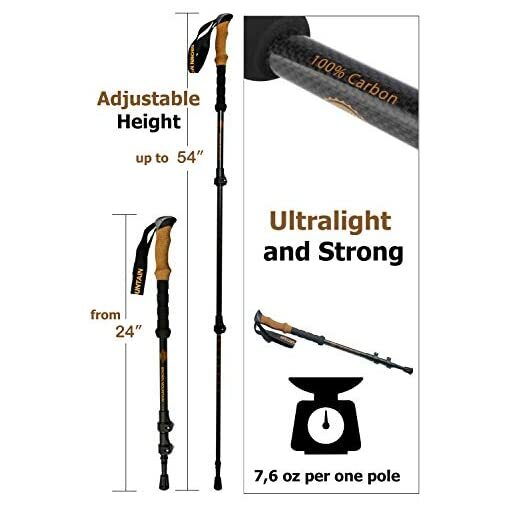 ULTRALIGHT CARBON FIBER TREKKING POLES are super light weight at just 7.6 ounces each. Yet you get the strength of steel. 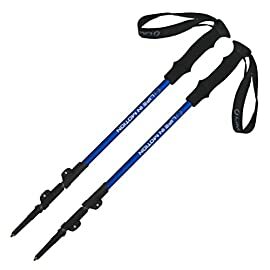 Put all of your weight on these. 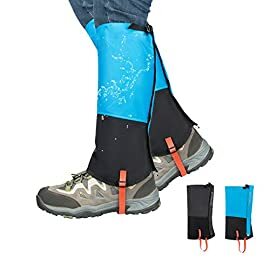 They hold up well hour after hour of intense hiking on all surfaces and in every condition. 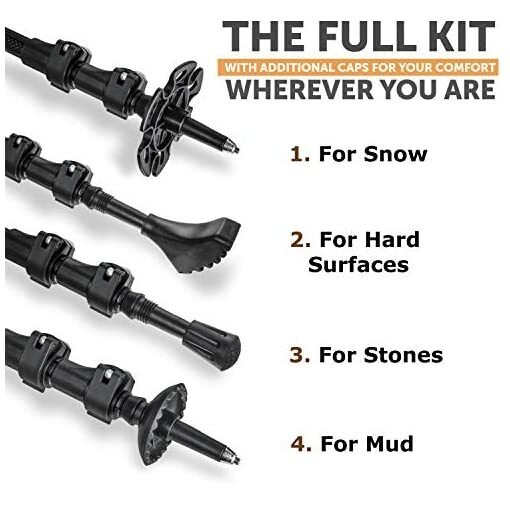 From mud in summer to snow and ice in winter, you’ve got a set of poles in an effort to make walking, hiking, and snowshoeing a supreme pleasure. 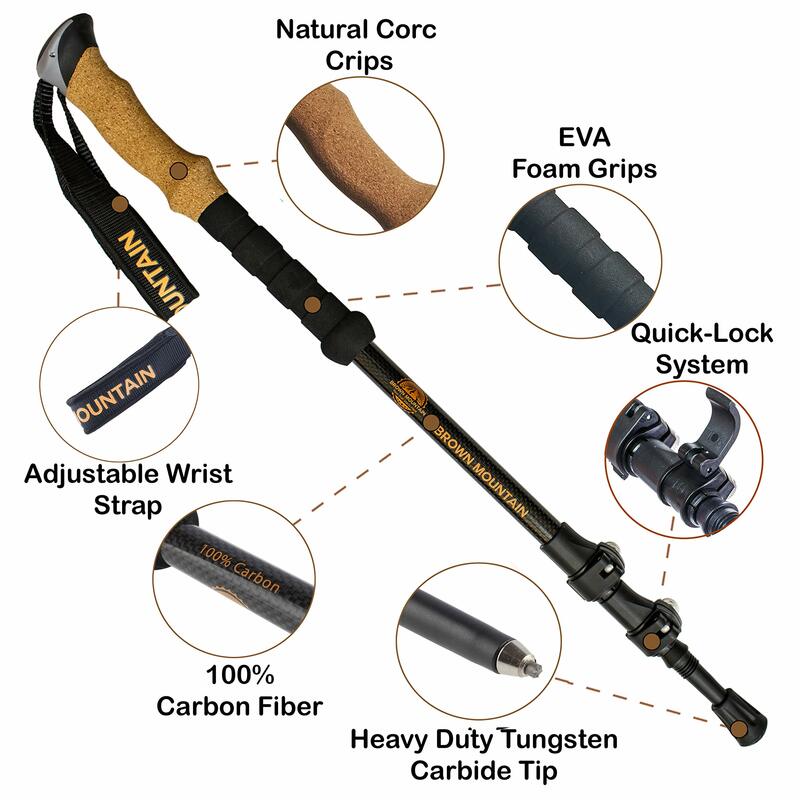 FULLY ADJUSTABLE TELESCOPING to perfectly match your height and use. 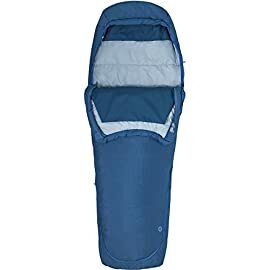 These can accommodate tall adults then shorten to fit a child. 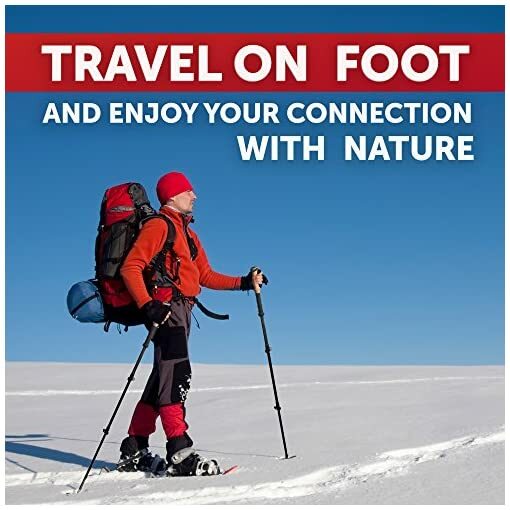 Many people get 3 or 4 pair so all the family can go hiking, mountain climbing, or walking together. This one model fulfills the needs of everyone. WE INCLUDE ALL YOUR TIPS, FEET, BASKETS AT NO CHARGE! 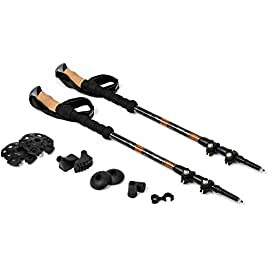 This trekking pole kit includes 2 Rubber Tips, 2 Rubber Feet, 2 Mud Baskets, 2 Snow Baskets, and carrying bag to keep your poles and accessories organized. This set is light and compact. 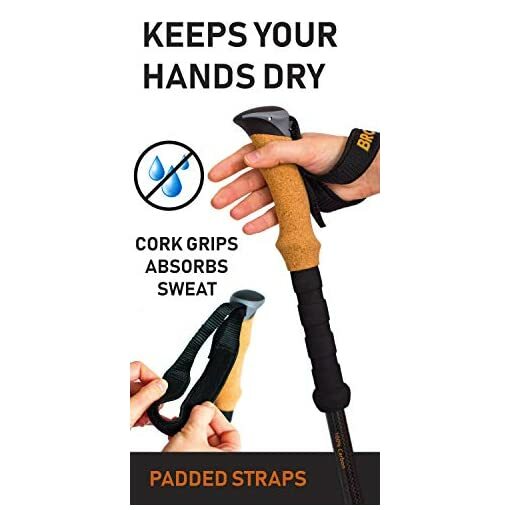 Put it in the carrying bag and place in your backpack, use the strap to hang around your shoulders, place in the trunk of your car, or store in a closet at home for next time. 100% MONEY BACK GUARANTEE ensures this will be your best bet for a pleasing no-risk purchase. 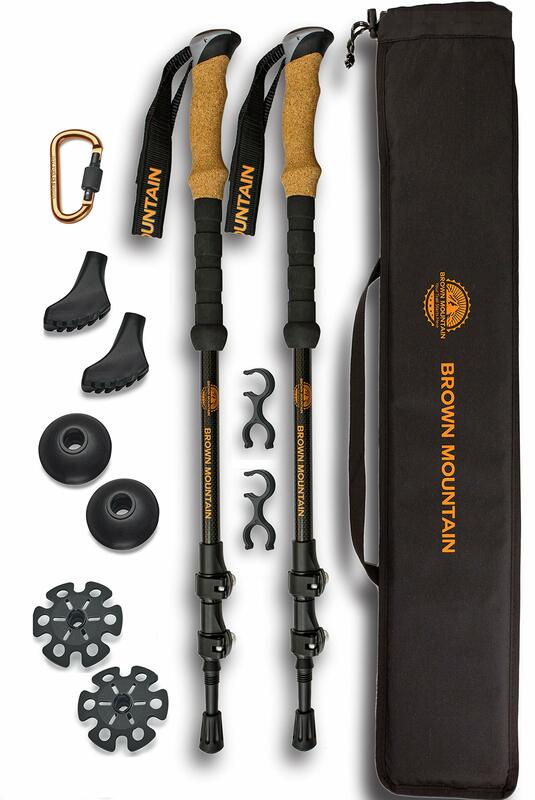 Many customers love these poles so much they return to buy one or two more sets to share with family and friends. 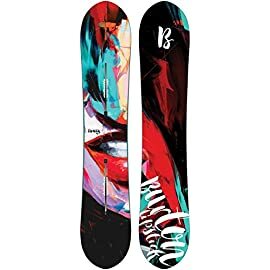 HURRY AND BUY NOW whilst we have a new shipment in stock. These make a much appreciated gift for friends, family and co-workers. 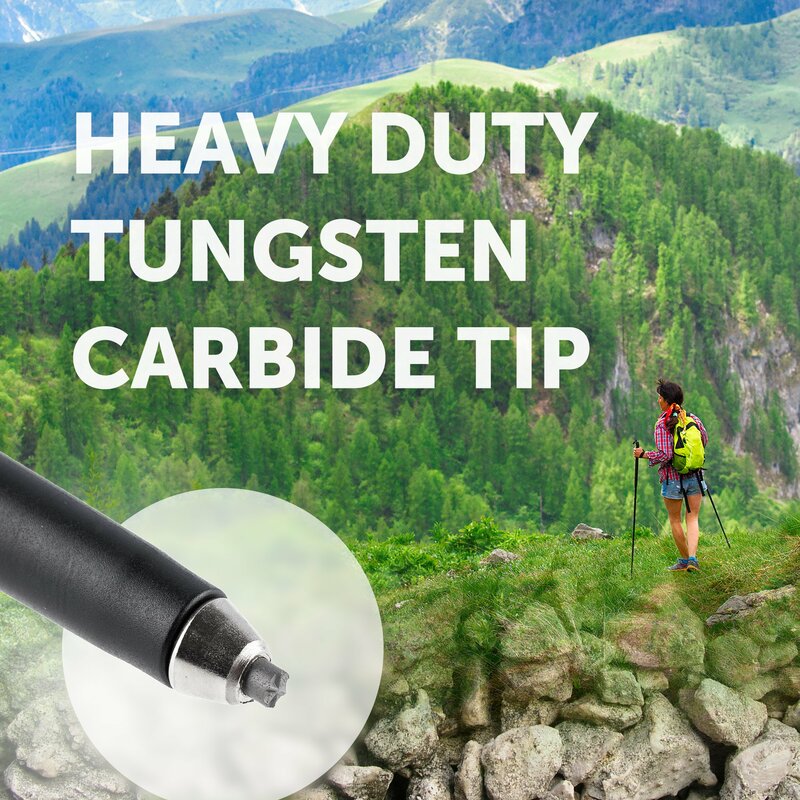 FINEST QUALITY TREKKING POLES with superior NEW design. 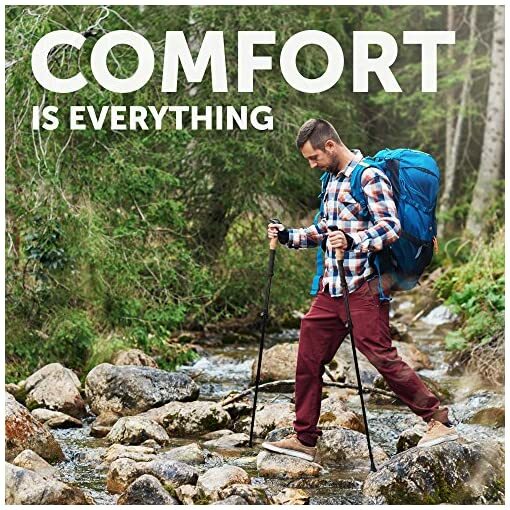 These are made of ultra-rugged Carbon Fiber that gives you remarkable stability whilst maintaining a very light experience. The length is fully adjustable to match your height and use. 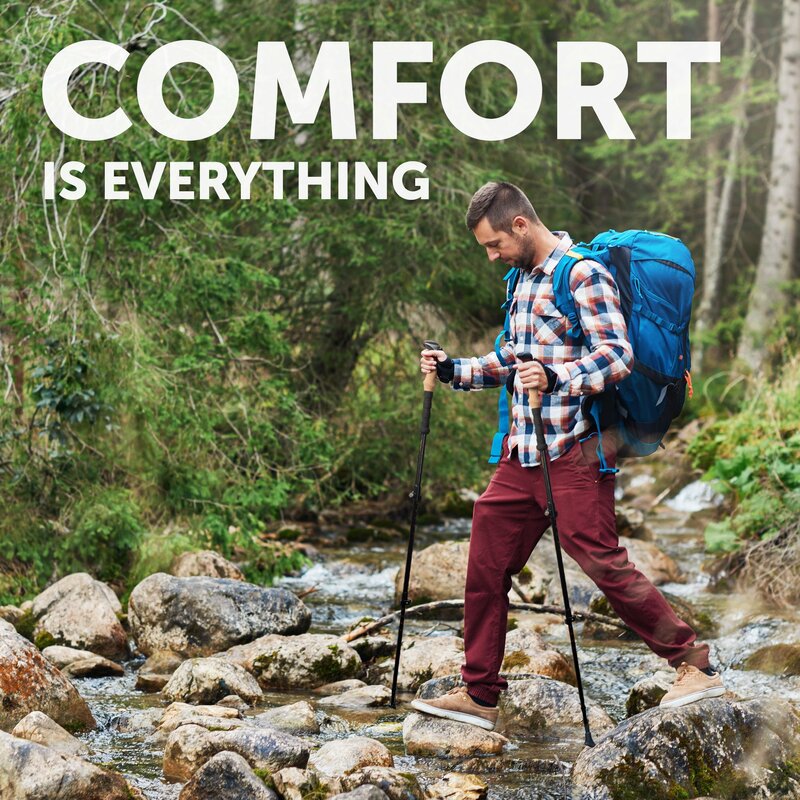 Your hike, snowshoeing, backpacking will be so much more comfortable. 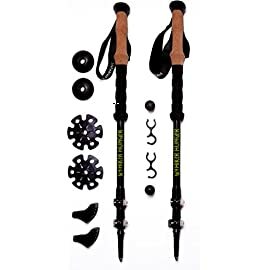 ALL TERRAIN WALKING STICKS allows you to trek on any condition including sand, mud, gravel, asphalt, snow, ice and more. 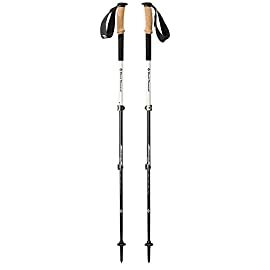 ULTRALIGHT CARBON FIBER MATERIALS makes thease these walking sticks very strong. 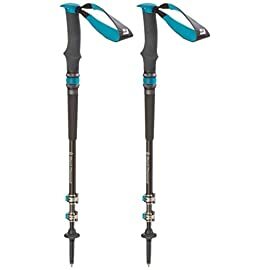 You’ll love how you’ll be able to walk all day and never get tired with these poles. 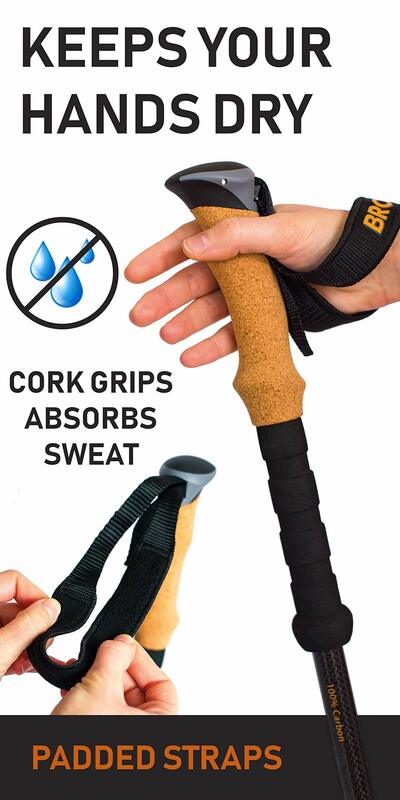 COMFORTABLE NO PERSPIRATION CORK GRIPS makes these walking sticks very comfortable. Further down the deal with there is a second gripping area of quality EVA Foam. 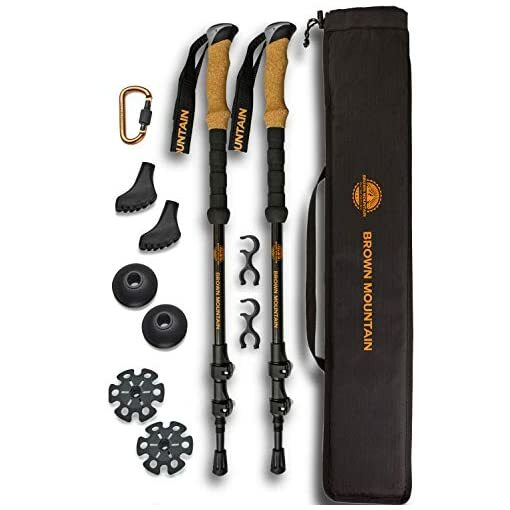 Great walking sticks for men, women, and kids sizing from 24″ up to 54″. 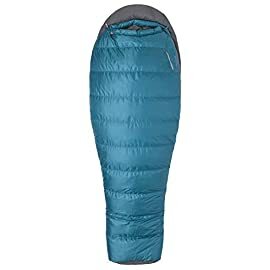 100% MONEY BACK GUARANTEE ensures this will quickly turn out to be your favorite no-risk purchase. 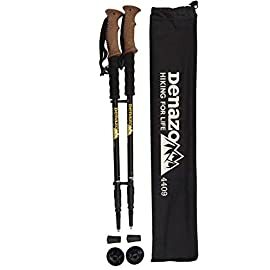 Many people stock up with several sets so the whole family can trek together. 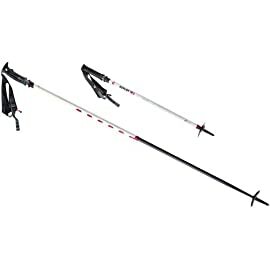 HURRY AND BUY NOW whilst we have this very popular trekking poles in stock. This makes a great present, holiday gift, or anniversary gift. 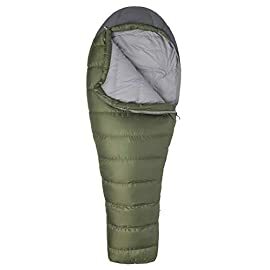 Just right for friends, family, and co-workers! 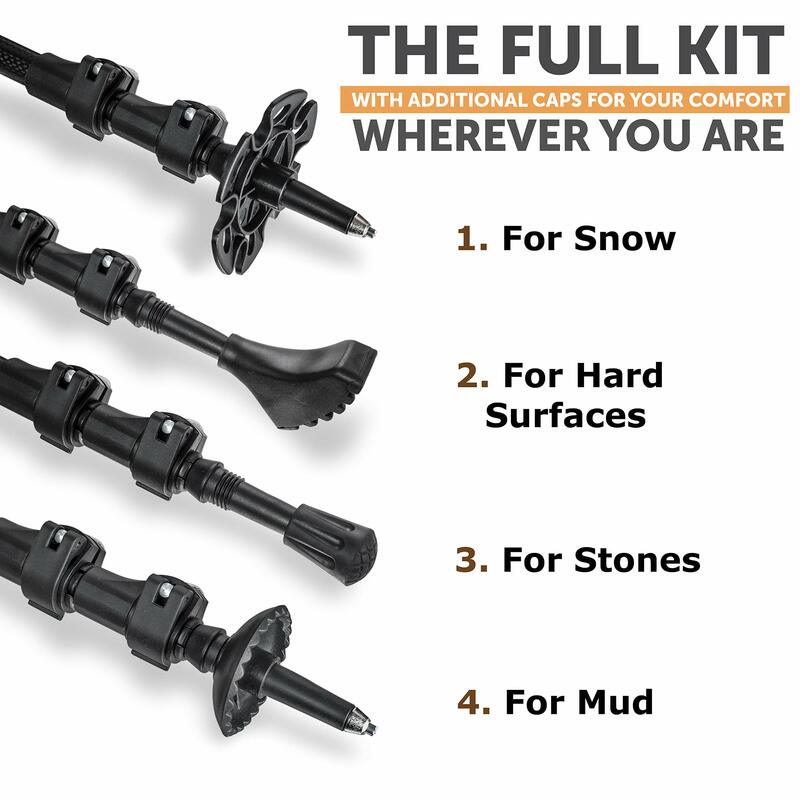 We offer 1-YEAR WARRANTY against all defects from the manufacturer!